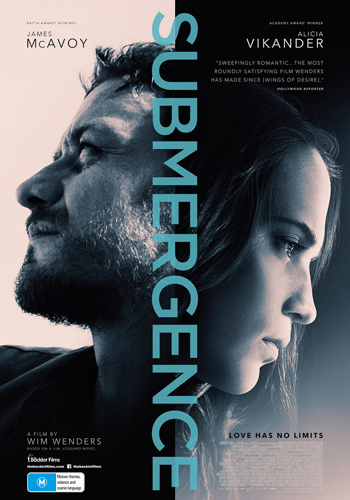 'Submergence' is a love story that takes us into the extremely different worlds of our two protagonists, Danielle Flinders (Alicia Vikander) and James More (James McAvoy). They meet by chance in a remote hotel in Normandy where they both prepare for a dangerous mission. They fall in love almost against their will, but soon recognise in each other the love of their lives. When they have to separate, we find out that James works for the British Secret Service. He’s involved in a mission in Somalia to track down a source for suicide bombers infiltrating Europe. Danielle ‘Danny’ Flinders is a biomathematician working on a deep sea diving project to support her theory about the origin of life on our planet. The 'Submergence' competition has now closed. Winners will be announced shortly. Competition opens at 5pm AEST on Sunday 5th August 2018 and closes at 11:59pm AEST on Sunday 12th August 2018. Five winners will be chosen at random on Monday 13th August 2018. To successfully win, entrants must fulfil the above entry conditions before the time the competition closes. Current members/followers are eligible to enter the competition. Only one entry per person. Only one winner per household. To be a valid winner, the entrant must not have won a prize from SWITCH within the last 28 days. Each winner will receive one double pass to 'Submergence'. By entering, you agree to receive occasional emails from SWITCH in the future. If you decide to unsubscribe from these updates, any further entries will not be applicable. Only Australian residents are eligible to enter. 'Submergence' is in cinemas from Thursday the 16th August 2018 through The Backlot Films.